After last week’s wonderful display, we should have gone into this game with a lot of confidence. But anyone who has watched Watford this season knows that you cannot predict which team will turn up. I must admit that when I heard that Blackpool hadn’t won away all season, my heart sank. We were joined in the West Herts by Jacob, a Danish Watford fan who was making his first visit to Vicarage Road. Having met Jacob at a pre-season game in Horsens in 2006, it was lovely to see him again and I really hoped that he was in for a treat. Jokanovic made a single change bringing in Vydra for Munari who had a hamstring problem. The starting eleven was Gomes, Hoban, Angella, Cathcart, Anya, Tözsér, Layun, Paredes, Vydra, Ighalo and Deeney lining up in a 3-4-1-2 formation. 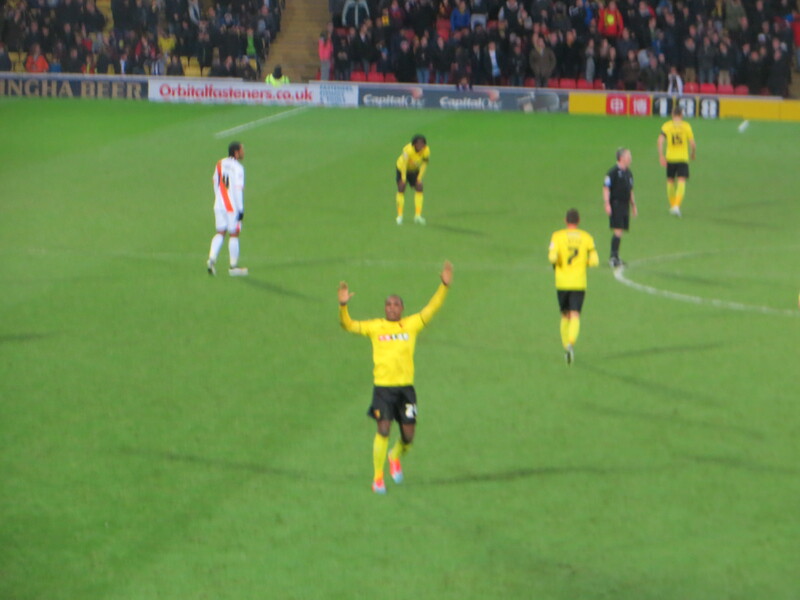 Blackpool featured Watford old boy Nyron Nosworthy who was given a great reception by the Watford fans. Before kick-off, there was a minute’s applause for Ken Furphy who passed away last week. As the manager who first took us to the old second division and the FA Cup semi-final, he is rightly revered among Watford fans and the applause was warm and loud. Blackpool made a good start to the game. An early cross was caught by Gomes with Davies challenging. Miller got into a good position, but shot just wide of the far post. Watford also had an early goal attempt from a Tözsér free-kick which Angella headed over the bar. The visitors took the lead in the 7th minute as Paredes tackled Ferguson in the box, the ball bounced off Gomes to Orlandi who buried the ball with the Watford keeper out of position. The home side tried to hit back immediately as Ighalo found Vydra who played a one-two with Deeney before shooting wide of the far post. Hoban played a ball over the top to Deeney, who appeared to have outpaced the Blackpool defence, but the defender recovered to make a tackle. A lovely passing move ended with Anya behind the Blackpool defence but his low cross was gathered by Parish before Ighalo could reach it. Deeney dispossessed Perkins and played the ball out to Ighalo whose shot was disappointingly weak and easy for the keeper. Paredes crossed for Anya whose shot was blocked by Parish, the ball came out to Deeney who tried an overhead kick that flew well over the bar. 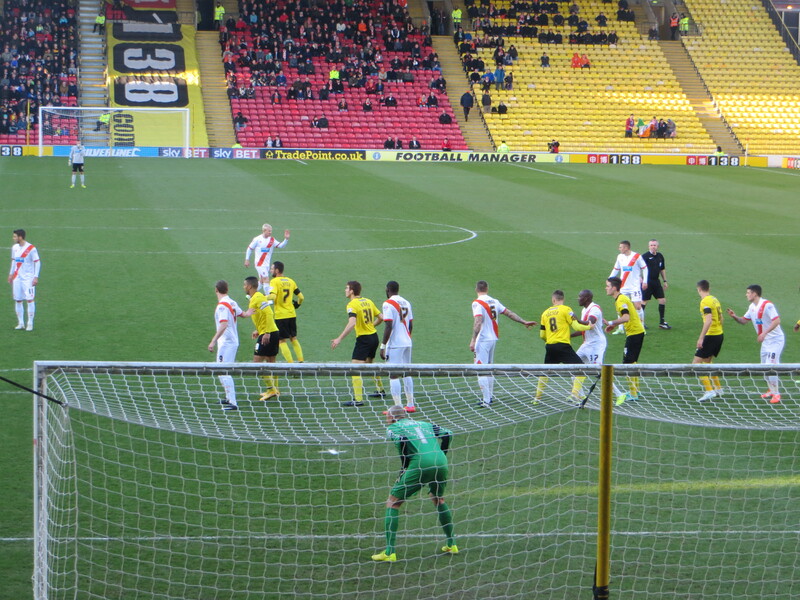 Watford’s next chance was a weak shot from Vydra that was blocked. Layun was the next to try his luck, but his shot from distance was well off target. Watford should have equalized on 32 minutes as Ighalo picked the ball up and unleashed a shot that Parish did really well to push over the bar. 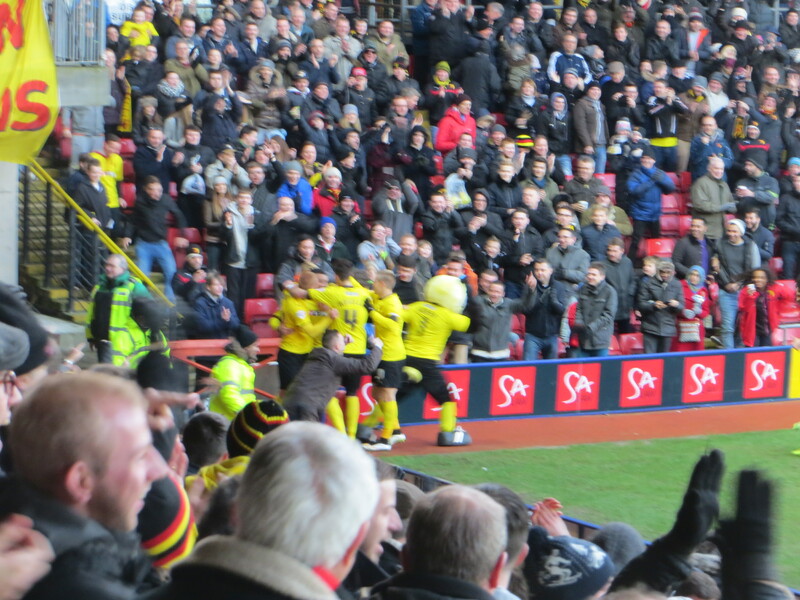 The pressure on the visitors’ goal continued as Deeney played a low cross to Vydra but the Czech’s shot was blocked. The only yellow card of the game went to Blackpool’s Davies who was booked for kicking the ball away to delay a Watford free-kick. It was not his first effort at wasting time. Given that the pressure had all been from Watford since the early goal it was something of a shock when Blackpool went two goals ahead. A shot from Miller was going wide, but Gomes got a hand to it. From the corner, McMahon found Davies on the goal line where he needed two attempts before he put the ball in the net. In time added on, Miller had a chance to increase the lead but Gomes dropped to gather. I must be becoming immune to boos from the home fans at the half time whistle as they didn’t register and I was only alerted to them when the bloke in front of me shouted “fickle fans” at those venting their displeasure. It had been an odd half. Watford had most of the possession, but had misplaced too many passes and the finishing had been woeful. We needed a bit more aggression. At this point I was feeling really sorry for Jacob. I have no idea what Jokanovic said in his half-time team talk, or what was put in the tea, but whatever it was it worked. He made a tactical change replacing Hoban with Ben Watson, who was making his debut after signing on Friday. Anya and Paredes dropped into a back four, so the formation was now 4-3-3. Within a minute of the restart, Watson won a ball in midfield, he released Ighalo who played it out to Layun who returned the pass for the Nigerian to beat Parish. Ighalo didn’t wait around to celebrate. He grabbed the ball from the back of the net and ran back to the centre circle. Watford were suddenly on fire. Vydra fed Layun whose cross flew wide of the far post with Deeney unable to connect. Then Ighalo passed to Deeney who took time to control the ball before shooting just wide. In a brief foray to the other end, the ball broke to Davies who shot straight at Gomes with the offside flag already raised. A Tözsér free-kick was headed clear by O’Dea, although I’m not sure how much he knew about it as the impact knocked him over and the ball flew in to the Rookery. My brother-in-law threw the ball back onto the pitch so is claiming an assist for the second goal which came as Deeney headed Tözsér’s corner home to level the score. Unbelievably, we were ahead on 53 minutes as a long pass from Layun was headed down by Deeney to Ighalo who swept it under Parish and into the net. The Nigerian did feel able to celebrate on this occasion. Watford’s fourth came soon after as Anya broke down the left, his cross was cleared, but only as far as Vydra who buried it. If the fans were happy to see Vydra score, it seemed that the players were even more so, they looked delighted for him as they celebrated. Blackpool had a chance to pull one back as Gomes had to be smart to turn an O’Hara free-kick wide. 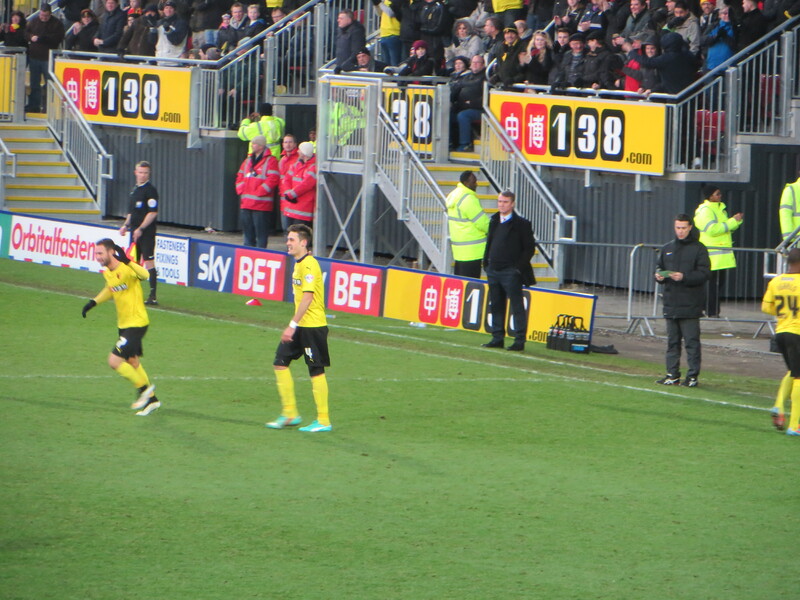 But that was a brief respite for the visitors as Deeney hit a cross which they were relieved to see headed out for a corner before it reached Angella. Nosworthy almost got on the scoresheet for his former team but he turned the ball just wide of the goal. From the corner, Angella headed the ball against the post, looked annoyed with himself and made no mistake with the follow-up to put the Hornets 5-2 ahead. 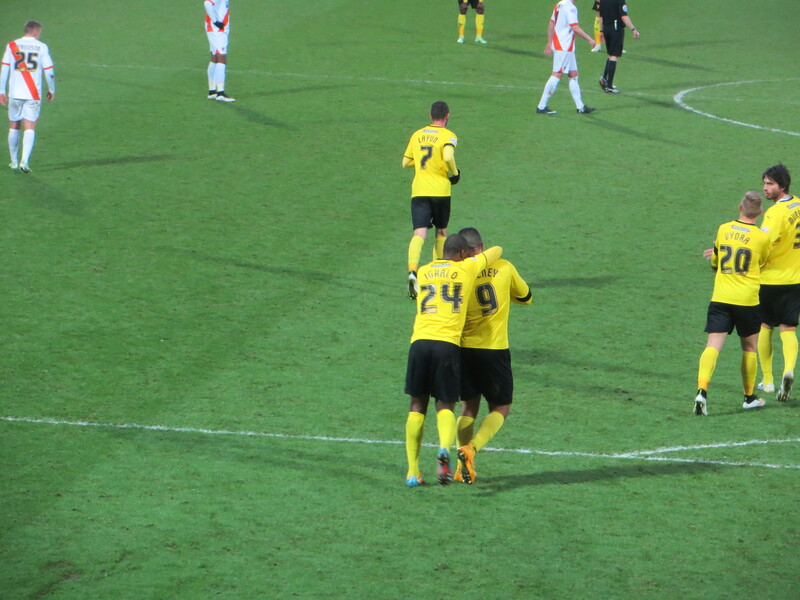 Anya went on another storming run down the left and passed to Vydra whose shot was saved by the feet of Parish. 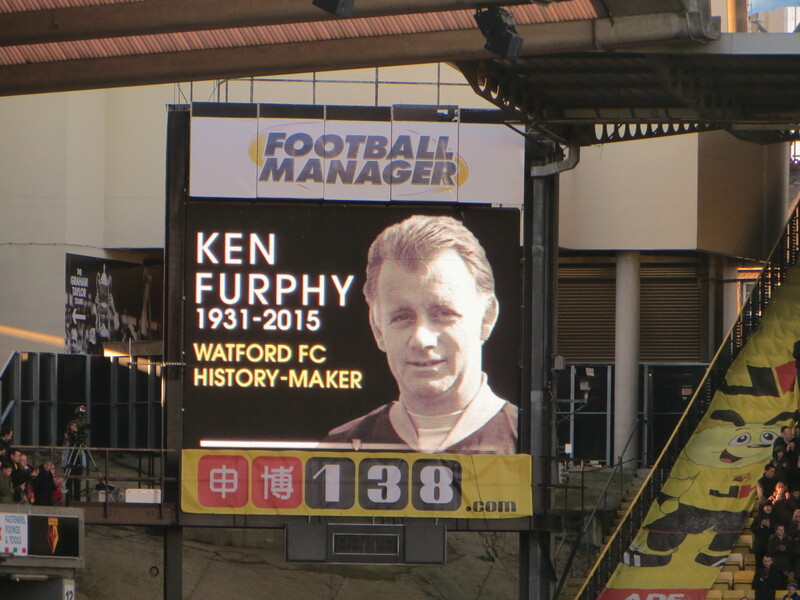 On 68 minutes, Ken Furphy’s picture appeared on the big screen again prompting a minute’s applause to remember his achievement in leading Watford to promotion to the second division for the first time in our history in the 68-69 season. The home side continued their siege on the Blackpool goal as Deeney crossed for Vydra who nodded the ball down to Ighalo whose shot was saved. Ighalo’s hat-trick came on 72 minutes as Vydra played a through ball to Deeney, his shot bounced off the post to Ighalo who headed it in. Jokanovic made his second substitution bringing Munari on for Tözsér. With 10 minutes to go, Watford made it 7 as Deeney broke into the box and unselfishly played a square ball for Ighalo to tap into an empty net for his fourth goal of the afternoon. There was only time for Anya to make way for Pudil. The last 10 minutes were goalless. At the final whistle, the ground was jumping and the players were warmly applauded. Ighalo received the man of the match award for the second week running and looked delighted as he walked around the pitch proudly clutching the match ball. Jokanovic’s half time changes will have done a lot to win over the more sceptical among the Watford faithful. The early goals in the second half seemed to instil confidence in the Watford players and inject an energy that had been missing in the first half. An unexpected joy was the work between the three forward players. They were all playing for each other, which meant each of them put in a more effective performance. There was just one niggling concern. I hope that nobody tests that half-time tea for additives. Oh, and someone needs to stop Jacob returning to Denmark. This entry was posted in Watford FC and tagged Andrea Orlandi, Ben Watson, Blackpool FC, Craig Cathcart, Daniel Pudil, Daniel Tozser, Darren O'Dea, David Ferguson, David Perkins, Elliot Parish, Gabriele Angella, Gianni Munari, Heurelho Gomes, Ikechi Anya, Ishmael Miller, Islam Feruz, Jamie O'Hara, Juan Carlos Paredes, Matej Vydra, Miguel Layun, Nathan Delfouneso, Niall Maher, Nyron Nosworthy, Odion Ighalo, Peter Clarke, Slavisa Jokanovic, Steve Davies, Tommie Hoban, Tony McMahon, Troy Deeney, Watford FC on January 25, 2015 by franelynn. Great report from a great day. Let’s push on now. 3 points against Bournemouth and we can start believin.